1) For the first time since January, I'm on track to finish my sixth craft till Christmas at the end of the month. Crazy! And to think, this was the month that I said I probably wasn't going to even work on a craft-till-Christmas project. A few weeks ago I announced that I would be doing haircessories and a haircessory holder for this months craft till Christmas. I've shown you a few tutorials on some of the haircessories. And I plan on doing a few haircessories throughout the next few months as well to add to the bunch I've done this month. But I'm capping off this month's craft/gift item with this haircessory holder. 1) Sand any rough spots on the board. 2) Mark where you want the knobs and pulls. Then use power drill to make holes. 3) Paint. Let dry. Paint another coat. Let dry. 4) Put pulls and knobs on and embellish. 5) Super glue ribbon on to the back of the board. Cover back of board with felt to protect wall from getting marked up by screws. As you know, these will be tucked away until Christmas. My Christmas cupboard is getting full, and I'm beginning to start thinking I may need to find another hiding place for these gifts. A few people have commented or e-mailed that they don't have girls to make this for. My recommendation is . . . make it for yourself and use it for jewelry. Poke earrings/nose rings through the ribbons, hang cuff bracelets on the pull and put other bracelets and necklaces on the knobs. I have this on my list to make for myself as a jewelry holder if I ever find the time. In the mean time, I'm thinking about my August craft . . . my fifth craft till Christmas! Wow! I've actually stuck with something longer than a few months. I just might actually complete my entire goal of a year of Christmas gifts! Honestly, I'm shocked, excited and ready to . . . 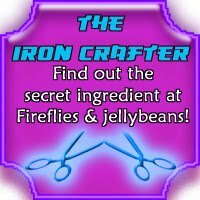 I was kind of excited when Fawnda and Jeannine announced that the secret ingredient for this round of Iron Crafter was knobs and hinges because I already had this in the works. It fit perfectly. However, there is another amazing crafter/blogger who had similar inspiration for the contest. And I'll be honest, I think her project rocks. I love the lettering she did on it, and it's not as busy as mine. Go check Mandy's entry in the contest out at Sugar Bee. This turned out really cute!! I really need to make a new one of these for my little girl...I have already filled up one bow holder. Great job! And I think that yours is just as cute as Mindy's...They both are ADORABLE! Okay, I LOVE your blog & am now a follower! Way cute!! I love the combination of hardware and cutting board. FUN! I love all the stuff you used to make it! SO creative and functional. Cuteness! Very cute and clever! This would be so handy in my girls bathroom! Going to have to add this to my To Do list! I thank you for this tutorial. My girls thank you for this tutuorial. Knobs for hanging hairstuff - Priceless. Now I've got to find some cute knobs to match their room decor. Did I say thank you! Thank you for sharing your creative idea. Great hair tie holder! I'm sure it will go down a treat at Christmas. I just made hanging hair tie holders for my girls from a pair of their old jeans - and they love that they can see all their hair stuff now - they even manage to put them back after using them!! Super cute! 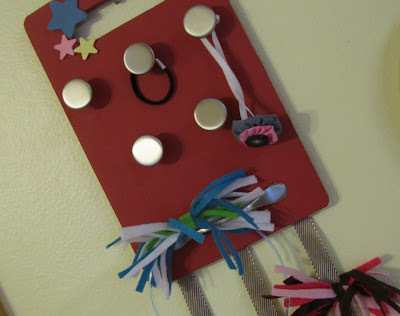 I love how you are using the knobs, so creative! Now THAT is creative! Great work. I have a friend with 3 girls that I know will be making at least 3 of these when I send this to her! Thanks for the inspiration - great post! I love this idea. I really need to make some of these for my girls. Very cute. I'm hosting We're Organized Wednesday this week and would love for you to join the party. THere's a great giveaway too. Hope to see you there. Thanks for linking with Sugar & Spice. Very cute! visiting from Life as Lori, but I've seen this pop up all over this week! So creative! Don't you love power tools?!? They're my favorite! The possibilities are endless in making it your own! What a cute idea! I love the knobs and handle! Thanks for linking to Hoo's got talent!